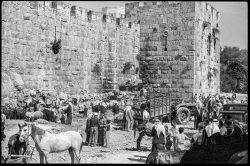 Najib Joe Hakim shares images he took while living in Jerusalem in 1978-79 and the summer of 1981.The timeless photographs are annotated with anecdotes from his journals of the time. 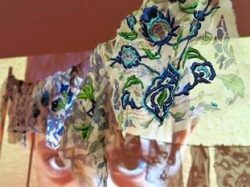 Yasmine Dabbous explores how fabric becomes a psychological, political and economic force for Syrian refugees, the women whose embroidery gave them solace and income. Embroidered patterns from Damascus tiles represent the anchor trauma-inflicted refugees yearn for. Molly Sinclair McCartney’s photos of her visit to Syria before the war remind us of the life that once was.